You can see how a the ripping technique can really add dimension to a page! I completed this scrapbook page about a year ago. I am in the process of making a "Birthday Scrapbook Album" for both Nathan and Ellen. This is Nathan when he was one-month old. Until he reached a year, I made a scrapbook page for every month! After he reached a year, I made a page only for his birthdays. In this layout I wanted the ripped edge to be white. To do this I held up the orange-striped page and pulled the left-hand corner towards me ripping the page from top to bottom. Click here to read more about the ripping technique! And you won't believe how I made the perfect title on the left. Click here to see how easy (and inexpensive!) it was to make! 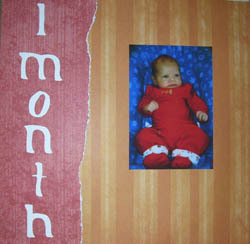 Find more excellent scrapbooking page ideas Joy-For-Scrapbooking.com!